Auto Recycling at it's Best! EAGLE AUTO PARTS is a full service automotive recycler. Offering services to the wholesale customer as well as the retail customer. 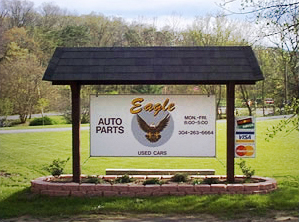 Eagle Auto Parts is located in the upper panhandle of West Virginia. The Eagle Team is becoming the most recognized name in the recycling industry that serves not only West Virginia, but also Pennsylvania, Maryland and Virginia. Eagle Auto Parts inventory is computerized, racked and ready for immediate pickup or our fast delivery service. We process all cars in the most professional manner. The process insures the quality of all our parts sold.